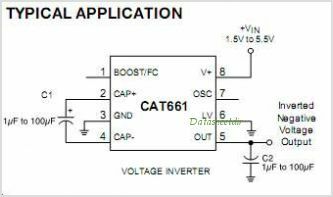 The CAT661 is a charge-pump voltage converter. It CAN invert a positive input voltage to a negative output. Only two external capacitors are needed. With a guaranteed 100mA output current capability, the CAT661 CAN replace a Switching Regulator and its inductor. Lower EMI is achieved due to the absence of an inductor. This is one package pinout of CAT661,If you need more pinouts please download CAT661's pdf datasheet. 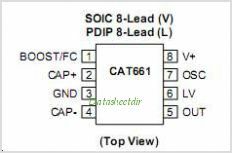 This is one application circuit of CAT661,If you need more circuits,please download CAT661's pdf datasheet.